How does the SEND model work? Back in February 2018 we released version 1.0 of our Witan SEND model. Our aim was to help local authorities (LAs) get a better understanding of future demand for services in terms of their SEND population and budget. Working with a number of LAs across the country, we discovered that one of the key areas they needed help in resolving was getting an accurate handle on the ever growing number of children and young people requiring Special Educational Need and Disabilities (SEND) placements, with the added challenge that many authorities were having their education budgets frozen. This type of modelling is time consuming, complex, and requires extensive mathematical expertise to develop, making it economically and practically infeasible for most authorities to do in-house. As public sector data science specialists, we are well placed to develop a robust and repeatable mathematical model, that will help to tackle these significant challenges and provide the confidence that local authorities require to support strategic planning and organisational decision making. Amongst the sorts of questions LAs wanted to address were; how many individuals should we expect to need SEND support, what would that cost, and what actions can we take to better provide for that population and budget for their needs. Many LAs are already having a first attempt at projecting their SEND population, by looking at their historic population and EHCP growth and projecting this forward. This does not however take into account much of the complexity surrounding SEND planning and provision. 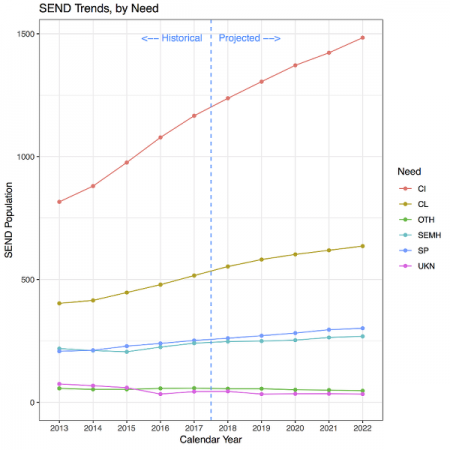 SEND needs and settings, and the costs associated, vary greatly, so predicting that, for example, the overall SEND population will increase by 100 people in the next year does not give the head of SEND the information they need to plan appropriately. . Working with LAs we found that transitions within the SEND system are what drive the trends which create the future population profile. The rate of joiners and leavers in SEND is strongly correlated with age (e.g. many needs are described when children first enter school), whilst the transition between settings is equally dependent on the needs an individual has (i.e. a person with need X typically will transition from setting A to setting B). The SEND model uses point estimation to derive probabilities associated with transitions between “states”. A “state” is comprised of an individual’s academic year, need and setting/placement. With these probabilities we can then use a Markov chain method to project forward a likely sequence of transitions for every member of the SEND population, plus new people who we predict will appear in that population. A Markov chain describes a sequence of possible transitions based on the probability of each events occuring in respect only to the previous transition. In this sense it is “memoryless”. If we repeat this process thousands of times, and aggregate the results, we can get a detailed breakdown of the likely overall SEND population in the future. As we include data concerning need, setting, age and associated cost, as well as the overall population count, we are able to break down the population into specific clusters in order to say, for example, “in 2021 we expect there to be X individuals with need A, Y of these in setting B and Z in setting C, adding an additional cost of £D”. Once we have what we call the “baseline projection”, which shows what would happen if things continue as they are, we can then also model alternative scenarios. So for the previous example where we have X individuals with need A in setting B, but we would like 50% more of those need A people to be in setting C (for example, if we think more pupils with an autism diagnosis could be supported in mainstream settings), we can apply a modifier to the expected transitions rates whereby we have fewer people with need A joining setting B, and instead that same expected number instead joining to setting C.
Our model uses a Markov Chain methodology with transition rate point estimation in order to accurately project a detailed breakdown of the future scope of a SEND population and the associated costs. The value and benefits of having this level of insight for an LA are clear. In addition to providing a more accurate overview of their current SEND population, they also gain the ability to make planning decisions with more confidence, based on the actual data. With this they are able to plan and allocate future budget and resources more effectively, based on the concept of testing multiple scenarios and potential solutions. LAs we are working with are already using this information in order to inform their future planning, and we are actively looking for others to work with the make use of, and help to improve and develop our future projections. To learn more please contact us at theteam@mastodonc.com.